13th June - about to leave London with Rob, Tom, Aled and Archie. 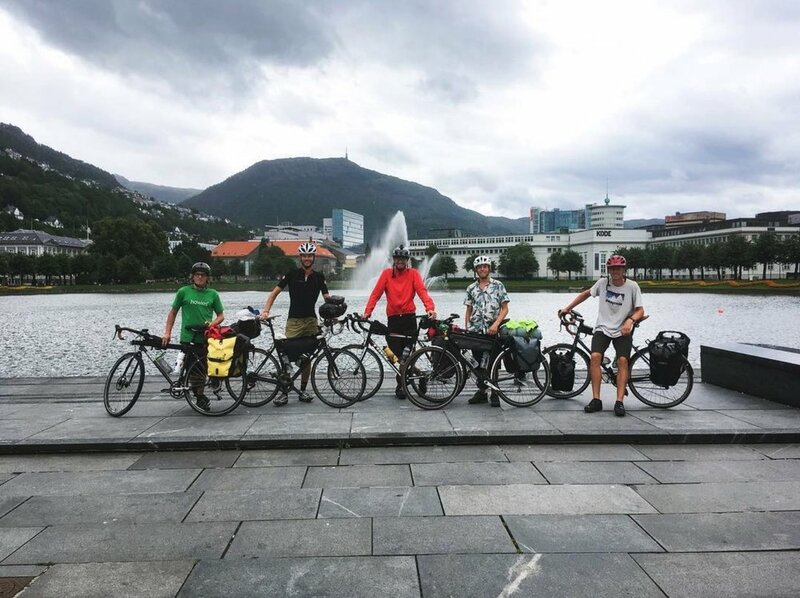 For 7 weeks this Summer I rode from London to Bergen, Norway over 4000km of some of the most varied terrain you could feasibly cover on a rigid bike. Everything from the tarmac of dreams, to rim-destroying-pothole littered towpaths, decrepit cobble roads, 3-inch-deep gravel tracks and bridleways which would have been good fun on a short travel trail bike. 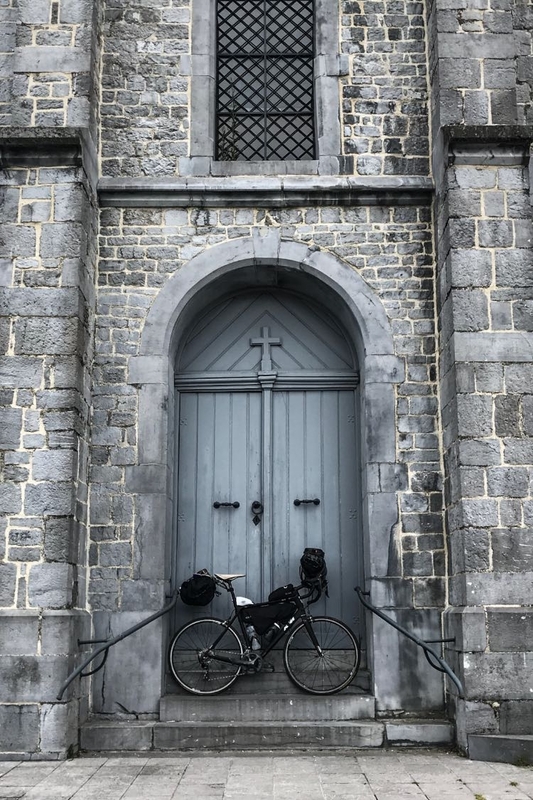 We rode through 7 countries and in general we were riding on either national cycle paths or Euro-Velo recommended routes. Probably 90% on road, 10% take what you're given, usually with some added spice. Final set up. Arkel Rollpacker 25L seatpack, Alpkit custom framebag, Salsa Anything handlebar bag. 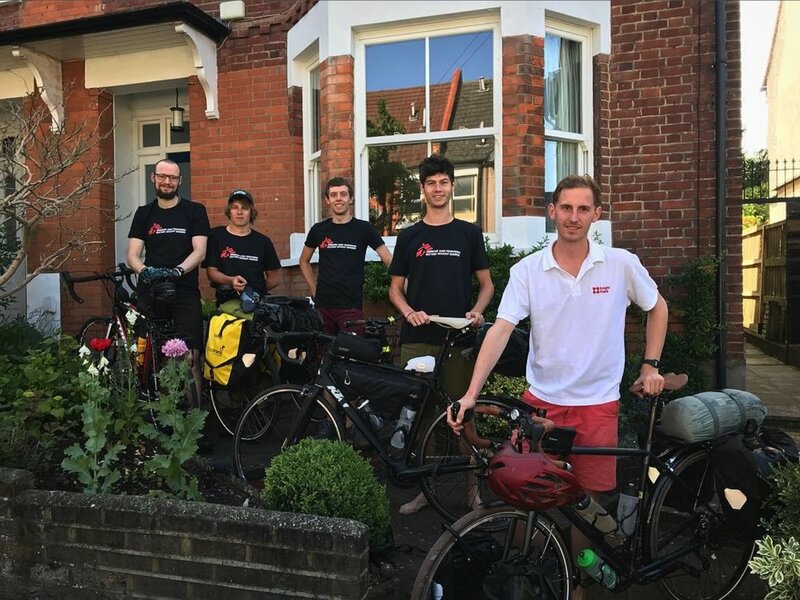 As full time mountain bikers with one bike each, the other guys chose to buy touring bikes to make the trip. 3 went for steel, one a low-end Trek road bike and I decided to use the ~7.2kg KTM Revelator road bike I've had for a few years. I couldn't afford to get a new bike and wanted a set up which I could use for bike packing on my mountain bike so pannier mounts weren't required. The one thing I'd have to highlight is that I don't weigh that much so even with the added weight of the full bike packing set up, the total weight on the frame/wheels was still comfortably under the recommended max weight for either component. You'll need to do the maths and work this out yourself. Also, all the weight I added to the bike went through the handlebars/seatpost (i.e. where it normally does) - it is possible to buy pannier adapters which clamp to your seat stays or similar, but if you ask me this is a pretty sketchy idea as frames aren't designed for that kind of load. I made a couple of tweaks to make my life easier/more comfortable on the road. First was changing the saddle and seatpost from the lightest full carbon pairing I could find on Alibaba to a Brooks C17 and back to the original KTM own brand aluminium post. The carbon Specialized Toupe replica saddle has been great for 6 hour plus rides in the past but I couldn’t ignore the rave reviews of the Brooks saddles so splashed out. The Arkel seatpack I went for mounts to the saddle and seatpost so I went back to metal just for piece of mind. Next I decide a new drivetrain would be wise given the old chain and cassette had a couple thousand kilometres wear. It gave me the chance to change my ratios so I went with a 11-34t cassette (which needed a new rear mech) and new chain. Coupled with a 34/50t compact chainset I felt like this would be plenty for what we had planned. I think I probably could have got away with 11-32t and saved on the new rear mech. Tyres. I was running some 23mm generic lightweight racing tyres and wanted to go as high volume as my frame/callipers would allow. One of the compromises of touring on a carbon racing bike is the limited clearance so 25mm was as large as I could go. I’ve used Continental Gatorskins before with bombproof reliability and went with a pair. 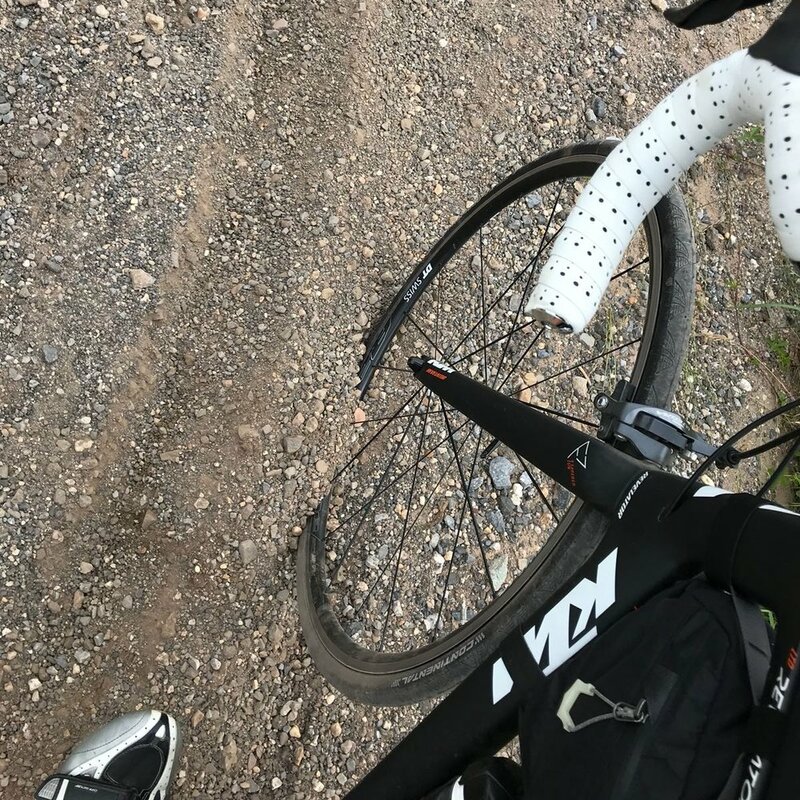 Of the 5 of us, I had by far the least punctures (the others were on 38mm tyres) but did have to deal with skinnier tyres on the occasional deep gravel section. I wouldn’t hesitate to use the same set up again though and the lower rolling resistance made a huge difference on the tarmac. I flipped the stem and bumped it up 10mm on my steerer after a weeks riding which made an instant massive difference to the pressure on my hands. I also ended up buying a new roll of bar tape after 1500km and wrapped it over my original tape to dull the road buzz. Would have done this from the start if I’d known how uncomfortable it’d be doing 30+ hours riding a week on rough roads. I wouldn't say any of the changes I made were 100% necessary but the tyres were probably the one major recommendation I'd make or you'll probably find yourself going through a few tubes. In short, yes, you can tour on a silly light weight road bike if you're not too heavy already. 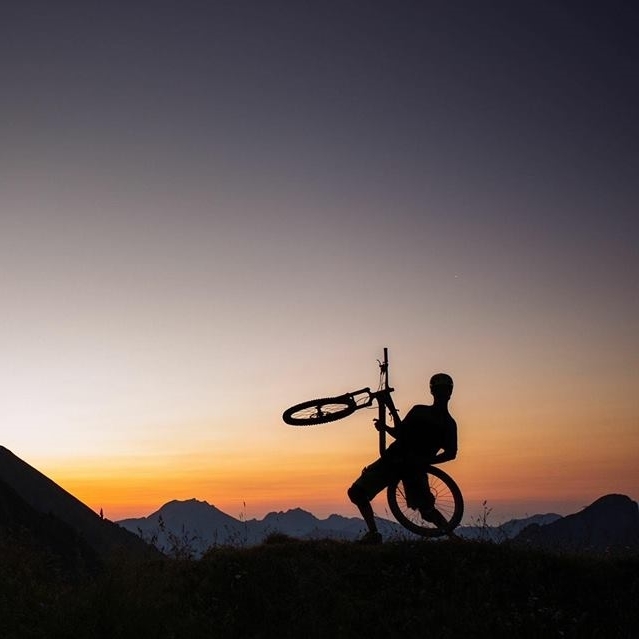 If you are, maybe borrow a different bike and save the light weight machine for the next tour when you've shed a few pounds over the course of the trip? My next blog post will go into detail of the bike packing set up I went for with some short reviews of each bit of gear. 2nd August - arrived in Bergen.